This international congress is a joint initiative of the Research Group CROS of the Department of Spanish and Comparative Romance Linguistics at Ghent University (Belgium) and the Department of Linguistics and Literary Studies (Spanish language) at the Vrije Universiteit Brussel (Belgium). The congress will take place at Het Pand (Ghent, Belgium) on February 5-6, 2019. The conference wants to contribute to the ‘measurement’ of the impact of English on Spanish, at various linguistic levels. Is it mostly to be situated in the domain of lexical borrowings, or can concrete cases of impact on Spanish syntax be identified? Can one observe a changing impact, for instance by the analysis of a particular phenomenon through different micro-diachronies? Is it true that the impact is to be situated among adolescents and younger generations? Although proposals including theoretical reflections and all kinds of concrete topics are accepted, we particularly welcome case studies on syntactic borrowings and calques (e.g. studies on the gerund, prepositional uses, and other constructions which may have changed as a consequence of Spanish-English language contact). Spanglish has rightly been treated as a socially, politically and culturally relevant research domain and has been the topic of many sociolinguistic studies. However, much less is known on what really happens in the minds of Spanglish speakers. This workshop wants to provide an interdisciplinary approach to the phenomenon (Rodríguez-González & Parafita Couto 2012), by combining linguistic and literary insights, and within each discipline by integrating different viewpoints. Although proposals including all approaches and topics about Spanglish (or Spanish spoken in the U.S.) are accepted, the following research domains can be defined. It particularly welcomes concrete case studies of Spanglish grammar (e.g. on phenomena of word order, discourse markers etc.). These could contribute to the general question of whether the image of linguistic chaos (González Echevarría 1997) can be replaced by the model of Spanglish as a ‘a third linguistic system’, rule-governed and full of remarkable regularities (Betti & Enghels in Press; Silva-Corvalán & Potowski 2009). We also particularly welcome papers that discuss the construction of corpora: What kind of empirical data can be used in order the study the phenomena? As such, the conference ties up with a more general discussion on the value of written data to study phenomena typical of orality. Should written multilingual texts be treated as a discourse genre in its own right and do they constitute a valuable source of information on how bilinguals make advantage of their enriched linguistic system in order to perform and translate highly complex cognitive tasks? It also wants to discuss the main challenges Spanglish is expected to be confronted with in the (near) future given that, more than ever, the identity of its speakers in the USA is at stake. Self-experience writing: Autobiography, Autofiction, Testimonial literature. Personal Geographies: Experiencing ‘nostos’ (return to the homeland), longing for home. Images of nostalgia and in-betweenness. In the search of roots and routes. We invite the submission of abstracts for full papers. Abstracts for an oral presentation (20 minutes + discussion time) must not exceed 500 words, including references, and should mention the main research question(s), methodology, data and (expected) results. Abstracts will have to be submitted individually and will be reviewed anonymously. Please submit via Easychair through https://easychair.org/conferences/?conf=cros2019. The conference languages are Spanish and English. The final program (version 01/02/2019) can be found here. El cuaderno de resúmenes se puede consultar aquí. On the night of February 5th there will be a conference dinner (50€) in the restaurant Brasserie Ha’. More information will be provided soon. if you would also like to participate in the lunches, coffee breaks and diner, you will have to register through the official form and pay the regular fee. We intend to publish a special journal issue of selected papers from the workshop. More details will be announced in due time. 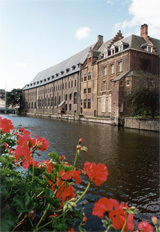 The conference will be held at “Het Pand”, the Cultural Centre of Ghent University. “Het Pand”, a former Dominican monastery, is located in the historical centre of the city, on the banks of the river “Leie”. The oldest parts of this impressive building date from the 13th century. During five centuries it was extended and refashioned in different styles. Since its rehabilitation and restoration, finished in 1991, “Het Pand” has been offering a wide range of possibilities for the organisation of scientific congresses and cultural events. “Het Pand” houses some valuable collections, such as the rich ethnographical and archaeological collections of the university, the Museum for the History of Medicine, full-size photographs of paintings of Brueghel and Early Flemish Masters, and an interesting collection of stained glass. A small map with the location of ‘Het Pand’ can be found here. 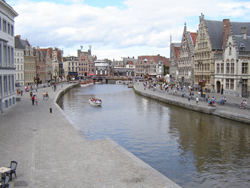 Ghent or Gent (in Dutch), lies in the heart of Flanders, between Bruges, Antwerp and Brussels. Its rich heritage has shaped the city into a living museum with a “medieval skyline”. It is by no means a coincidence that Ghent is often referred to as the historic heart of Flanders, a city of all times, and as one of the most beautiful historic cities in Europe. The city is after all a combination of an imposing past with a lively present. Not only the lovers of art and culture make their tricks in Ghent: also if you like to go shopping for a day, enjoy a good meal or have an entertaining night out, Ghent offers everything you require. 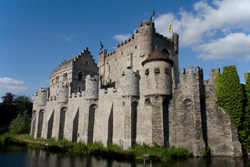 Ghent is an often neglected jewel when it comes to visiting Flanders, the Flemish speaking region of Belgium. Most visitors focus on Antwerp, Bruges or Brussels. But in doing so, they miss the opportunity to discover a city with a strong historical background that goes back to the Middle Ages. The city has been on the cross road of many political and economical shifts in the Western European context. Spanish, Austrian, German, Dutch, French, English,… have influenced the Ghent history and left behind traces, thus enriching a cultural heritage that reflects a unique blend of styles, traditions, architecture, and culinary trends. The city prospered due to the textile trade, and was one of the largest cities in Western Europe. Visiting kings envied the cultural patrimony and had to cope with the stubborn nature of citizens that strongly defended their autonomy. The city has evolved from a variety of settlements on the banks of the River “de Leie” and “de Schelde”. The city nearly equals Bruges when it comes to the number of museums, canals and bars. It offers a larger variety when it comes to contemporary art, theatres, and concert halls. Your list of “things to see” should include the medieval Gravensteen Castle, the belfry, the cathedral with the famous painting of the brothers Van Eyck “The Adoration of the Mystic Lamb”, the St. Nicolas Church, the three beguinages, monasteries, etc. Nowadays Ghent is an economical centre due to its renowned international port and a cultural centre due to the large concentration of educational institutes, varying from the Ghent University, the largest concentration in Flanders of higher professional education institutes, to secondary and primary schools. A description of how to get to Ghent from Brussels National Airport can be found here. Here is a list of good hotels in Gent, but of course, there are many more options for accommodation in the historical center of Ghent, at a walking distance from the conference location. Find us on the Sociolinguistic Events Calendar: https://baal.org.uk/resources/slxevents.